Prior to entering our partnership with Adaptall, our metric offering was undefined, confusing, and less than TIPCO's standard of service excellence... After partnering, our sales of metrics has grown over 70% and our value proposition to the customer base has increased dramatically... TIPCO Technologies is proud to call Adaptall a partner! Adaptall is known for having unmatched stock levels. In our experience, fill rates are over 98% on average which is unheard of when sourcing fittings, let alone Metric and British Adapters. The world class customer service and technical support is the other reason why I choose Adaptall. They really know their stuff!! Adaptall has been a reliable partner for many years now, and is key to our success in the foreign adapters market. Same day shipping and industry leading expertise is why I keep coming back. If you can’t find a Metric or British fitting elsewhere, they will have it on their shelves. Robert Barrese, Power Drives Inc.
24° tube fittings, or ‘Bite-Type,’ are the most popular fitting globally and employ the most advanced tube fitting system in the world. This system is capable of withstanding high pressures and extreme vibration, thanks to the cutting ring design. The cutting ring is a ferrule that incorporates sharp cutting edges. 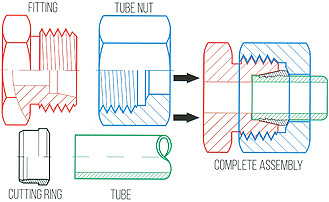 When a nut is torqued onto the fitting, the base of the nut comes into contact with the cutting ring, wedging it into the 24° tapered throat of the fitting thereby cutting into and gripping the tube.